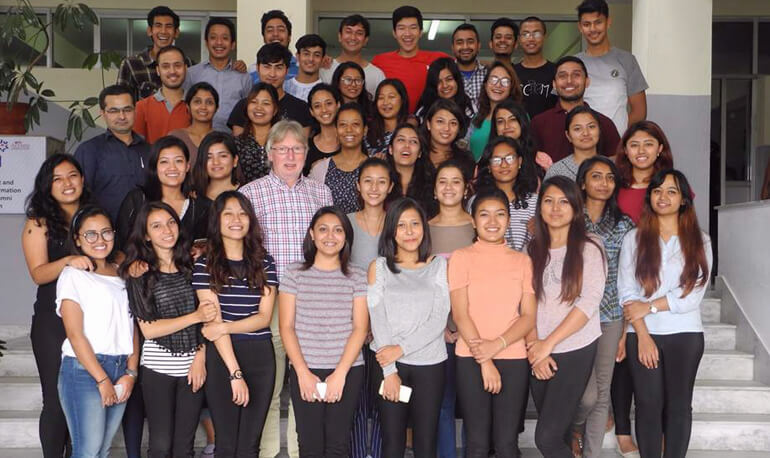 Mr.Ruedi Frank, Senior Expert at Swiss contact with over 25 years of experience as a director at UBS, a well known bank in Switzerland visited the students of Kathmandu College of Management (KCM) for a 7 days’ workshop. The workshop was on “Introduction into Switzerland and Swiss Financial Centre” which began from 9th September and ended on 19th September. Mr. Frank initially provided the students a brief introduction of Switzerland, its culture, its politics and its banking system.In the workshop; he highlighted the various trends that were popular in the banking sector of Switzerland as well as Nepal such as KYC concept, known as Know your customer. He highlighted the risks associated with the financial intuition and different risk Management techniques practiced in financial intuitions of Switzerland. Finally, he drew some light on foreign Exchange business and discussed about the various pros and cons about getting involved in the foreign exchange market.